Ben Stride: I'd hate to have to kill you. Masters: I'd hate to have you try. Budd Boetticher's name doesn't demand the kind of attention John Ford's does, nor does it lighten up the imagination like Sergio Leone's when one thinks of the western genre. However, along with Anthony Mann's films, Boetticher's work in the 1950s is part and parcel to the genre's revival in post-World War II America. For the past few decades, Boetticher's work has largely been unavailable or seen only at festival screenings in poor prints. Thanks to the wonderful work of Batjac Productions, however, Boetticher's masterful Seven Men From Now makes a welcomed debut on DVD. The first of the "Ranown Western Cycle," the film is a taut experience, sliding in at a lean 78 minutes. But rarely has such a short film been so dense, with subtext that would make a film scholar blush and gunfights that'll make the most weathered western fan roar. Ben Stride (Randolph Scott) enters a cave on a stormy night. Two men are camping near a fire, but his sudden emergence from the shadows startles them. Set to Burt Kennedy's expeditious dialogue, the scene clearly established Stride as a rugged, stoic man of honor. He exchanges words with the men, but what they don't say is the scene's point. Stride is an ex-sheriff whose wife was killed during a Wells Fargo robbery. Now he is seeking vengeance on the seven men who committed the crime, and the two in the cave will be the first. Stride continues forward through Arizona's harsh terrain, coming across a worldly couple who live helpless to the land's whims. John Greer (Walter Reed) and his wife, Annie (Gail Russell), welcome the help of Stride and travel south with him. Trotting along in their wagon, the Greers slowly come to learn about Stride, who barely speaks to them. It is only when Masters (Lee Marvin), a former criminal twice jailed by Stride, takes up with the caravan that John and Annie learn the full nature of Stride's odyssey. The former lawman's quest for vengeance, contrasted by Masters' opportunistic pursuit for the stolen money, propels the story forward swiftly, while Boetticher slips in astute character moments nearly subliminally. This is a B-movie in the best possible sense, with a modest scale that gives the proceedings a feeling of intimacy. The cinematography effectively mixes shots of the vast terrain with tight, deep-focus ones of the characters. Boetticher creates stunning compositions, often blocking off large portions of the set to foreshadow each character's own sense of imprisonment. Apart from the straight-laced Stride, no character's motives are entirely clear. Masters is an outlaw, and there's no telling whether he'll turn on Stride. Nor do the Greers have clear intentions, especially Annie. She's a refined East coast lady, but her husband's inept masculinity wears on her love and she quickly makes a connection with Stride. Watching these characters wrestle with their underlying passions while maintaining dignified personas is what elevates the film. Stride may be the lead character, but he's largely a passive player in the story. Motivated by a sense of lost honor, Scott's portrayal of the character is flawless. This is the archetypal western hero, sharing a great deal in common with Hemingway's own code hero. Utilizing subtle expressions and a keen disposition, Scott takes on the role with grace and humility, never assuming the traditional iconic poses. Gail Russell is equally impressive, delivering a lovely performance soaked in nuanced quiet moments in which her physical presence does most of the work. However, it is Lee Marvin who steals the show. His likable Masters is a wonderful monkey wrench in the script's gears, collecting the quintessential elements of Marvin's numerous villain performances into one cohesive whole. This performance is among the best of his career. This is a film of its time, pronounced the opening title song, but Boetticher's direction and Kennedy's script are so strong that it holds up alongside modern westerns such as Unforgiven and Open Range. Swift, assured, and visually engaging, Seven Men From Now is a forgotten milestone in the genre. 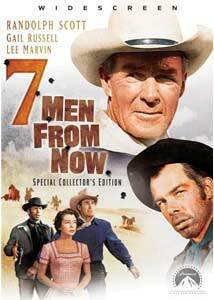 Image Transfer Review: After being out of circulation for years, Seven Men From Now debuts on DVD in a striking new anamorphic transfer. The WarnerColor is brought back to its original glory, with excellent detail and richly textured blacks aiding the transfer's aesthetic. Mosquito noise and grain are present, but not distracting. A few of the shots are slightly soft, but for the most part this is a fine picture. Audio Transfer Review: The film's original mono mix is spiffed up for this release, creating a clear and authentic representation of the original theatrical image. Dialogue is crisp and audible, with the score coming through strongly. From a purist's point of view, this couldn't be better. Photo Gallery�a collection of still pictures from the set. Extras Review: Along with its releases of Hondo and McLintock!, among others, Batjac and Paramount have assembled an impressive collection of special features. A highly informative commentary by film historian and western expert Jim Kitses starts things off. Kitses is well prepared, offering a wealth of analysis, only pausing at key moments when he wants the listener to hear the dialogue. He establishes the film's context in the genre, as well as offering information about Boetticher and the film's stars. The track is also full of numerous interpretations of the film, making for a thoroughly enjoyable time. Following that is a multi-part documentary, Budd Boetticher: An American Original (50m:37s). Each section runs roughly between five and ten minutes and contains interviews with Budd Boetticher (from archival footage), Clint Eastwood, Taylor Hackford, Peter Bogdanovich, Quentin Tarantino, and many more. Beginning with Americano, the documentary chronicles Boetticher's career and the beginning of his life, coming from a wealthy Midwest family and moving to Mexico and becoming a matador. The second part, Burt Kennedy, Writer, delves into his war record and its effect on his work. The documentary clearly illustrates the perfect pairing of the two men. After that, Duke, Randy and Budd: The Beginning of Seven Men From Now discusses the movie's production and John Wayne's own involvement in it (he couldn't star due his commitment to The Searchers). The interviewees also offer a great deal of explanation about B-movies and the kind of freedom it allowed Boetticher. Lovable Villains and Strong Women continues to discuss the film's unique contribution to the western genre, delving into its somewhat revolutionary portrayal of Masters and Annie Greer and the effect it had on subsequent movies. Returning back to Boetticher, The Last Matador explains his life after the Ranown westerns and is much more personal than the previous pieces. Wrapping up the documentary is Restoring the Legend, which contrasts the current restored print with the faded one. The section even discusses some of Boetticher and Kennedy's own objections to the movie and changes they'd have liked to make. The sections can either be played on their own or all together. Next is The John Wayne Stock Company: Gail Russell (13m:15s), a brief recap of her troubled, alcohol-ridden life. This is a brief but informative featurette, though the narration is a bit heavy-handed. A second featurette, Lone Pine (06m:24s), examines the locations used by Boetticher to make the film. This landscape has been home to numerous westerns, though the featurette doesn't give a great sense of its locale. Rounding out the special features are the film's original theatrical trailer, as well as trailers for The John Wayne DVD Collection and a Batjac Montage that promotes the company's various DVD releases. There's also a photo gallery. Thanks to an impressive documentary and commentary, the extras are a great bonus to this DVD. One of the best of its kind, Seven Men From Now is lovingly restored on DVD and in prime condition for today's audiences to rediscover it. The extras enhance the excellent presentation of the film, making this a topnotch release from Paramount.